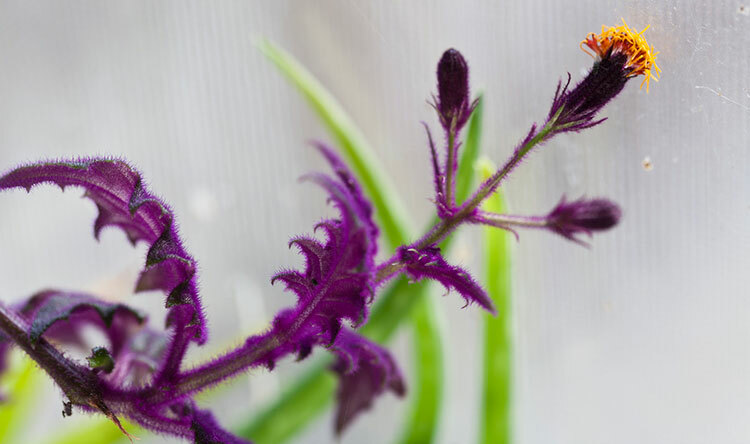 The purple velvet plant, or gynura aurantiaca, is one of the most unique houseplants you can grow. This is due to the odd velvety purplish hairs that it produces on its green leaves. 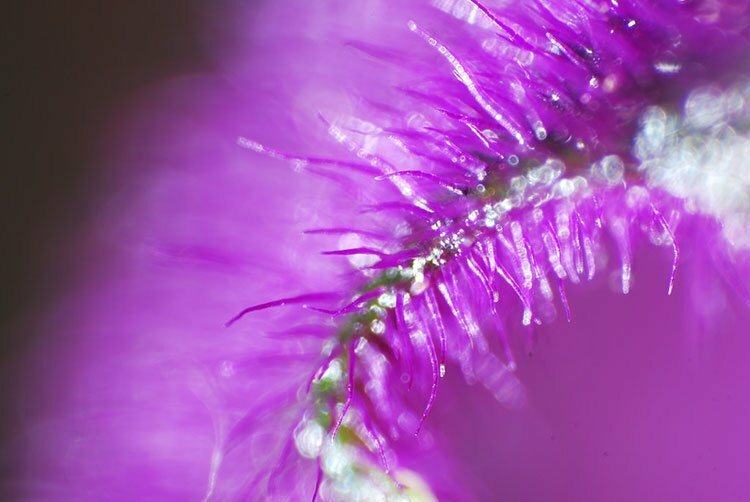 These plants have greenish leaves covered with velvety purple fuzzy hairs. Each leaf has multiple tips and the underside is generally a reddish purple. Blooms are a yellowish orange color and have a very bad odor. The toxicity level of gynura aurantiaca differs depending on who you ask. While it is listed on the non-toxic plant list and is generally thought to be non-poisonous, it should not be ingested. And, some people may have an allergic reaction to the plant. Caring for the velvet plant isn’t too hard, but it isn’t as easy as succulents or dead-simple houseplants like golden pothos. Gynura aurantiaca is a heavy feeder and can be fertilized once a week during the growing season. Use a simple high quality plant fertilizer that is diluted to 50% of the recommended strength. Purple velvet plants do well when root-bound and can thrive in small pots for quite some time. For this reason, you may never want to re-pot it. You don’t have to waste the cuttings that you prune off of your velvet plant! These cuttings root well in jars of water. Wait until roots form from your cuttings and then place them in a high-quality potting soil. The flower of gynura aurantiaca – remove these as they smell terrible! All of the classic houseplant pests can affect purple velvet plants: whiteflies, mealybugs, spider mites, scales, and aphids. To prevent these, it’s best to give your entire plant a scan from time to time (including the underside of the leaves). Douse the leaves in water or spray with neem oil for minor infestations. For spider mites, keep humidity high. The only disease you need to worry about is root rot, which is completely avoided if you water your velvet plant properly. You’ll know you are over watering if the plant feels soft and soggy. Q. The leaves of my velvet plant are wilting and it looks like it’s sick! What is happening? A. 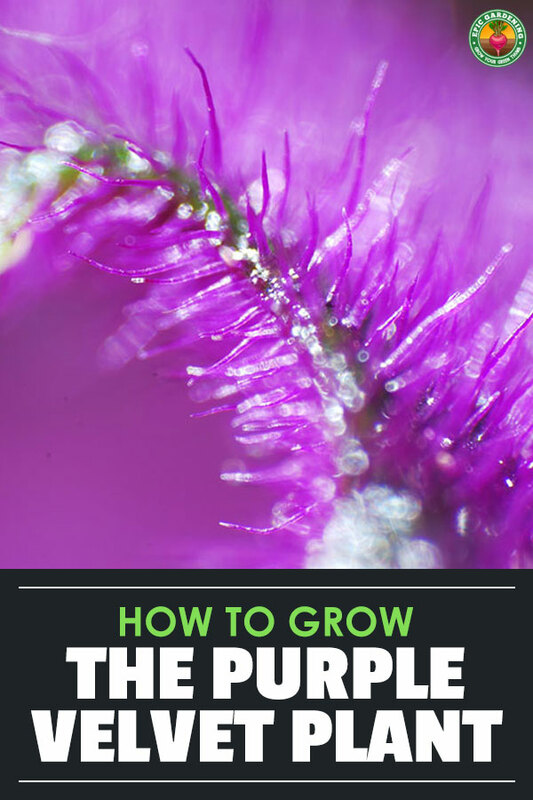 Because purple velvet plants are fertilized often, many gardeners will over-fertilize and use too strong a mixture. This leads to wilting and in the most serious cases, burning the leaves and killing the plant. Be sure to dilute your fertilizer and keep a watchful eye for signs of nutrient burn. Q. What should I do when my velvet plant starts to flower? A. While the orange flowers of the plant produce a nice contrast against the purple leaves, most people hate the smell. If you can’t stand the smell, you should pinch flowers off of the plant as soon as you see them. Q. My gynura aurantiaca is growing TOO FAST! How can I control it? A. Heavy pruning is your friend here. Cut stems 2-5″ from soil surface and don’t be afraid to be aggressive. It will come back bushier and squatter, which is what you want. Ah, interesting! Glad to hear this worked out for you! Any high-quality all purpose fertilizer at 50% mix will do the trick! my purple passion is losing it’s purple hue!! But, the new growth is coming in nice and purple. Any ideas why? Is it in direct sun? That can be a reason that the color goes away. Hi. I took a clipping from one of these plants a co-worker has at work. It has rooted beautifully but after I put the clipping in soil it wilted so badly and quickly that I took it out of the soil and put it back in water again because it was well on it’s way to dying. After 4 days of being back in water it is doing fine. I have planted clippings rooted in water for over 40 years and have never had this happen before. What did I do wrong? Could it be that there was something up with the soil? Or perhaps you needed to let the roots develop a bit more before potting it up? I had a plant years ago that had leaves like that and had a bright Halloween orange flower that was shaped similar to the Hawaiian state flower. At least it showed a picture of it. My chinchilla had freed himself and had dug up the roots and ate the too so I never saw the bloom. I was wondering I’d this might be the same plant or of it was a similar type. I know it’s not much of a descriptionbut it’s all I have. Thanks for any help you can give. Hubby is sensetive to it, so I keep it in an un-used guest room when it blooms. Does anyone know what it means when some of the leave get brown spots on them? Use Rescue Remedy, Gorse and Mimulus. 4 drops of each in your small watering container. Also use ionized water. Google “purple plates”. Ionized water replaces fertilizer. Most importantly, talk to the plant, and touch it regularly. HELP! i just bought my plant at wallmart and its in bad shape. I’ve always wanted one as well. All walmarts plants were in bad shape from shipping they said but i didn’t want them to through it away plus i really wanted it. now i don’t know how to revive it. i transplanted it and placed it in the sun. hope someone can help me seems like everyone here knows plants. i also think its in shock. I know this info is late, but for future reference the absolute best product for transplant shock is called Thrive (or any product containing mycchorizal fungi). The beneficial fungus attaches to the root system and makes more roots. Treat with Thrive and then fertilize one week later. I work at a nursery and this is the treatment we recommend. I bought one at Walmart in a small Valentine’s cup, replanted it and brought it to work. Everyone loves it, but it didn’t have the plant name–just stated tropical foliage. Well, now I know! It was only $1! I love it! I got mine at Krogers in a tiny lil planter, I replanted it and it is growing like crazy! I love this plant it is beautiful! But I will say this, once it likes a spot don’t move it! They are temermental! I moved mine and she started dying! I like to say she threw a temper tantrum lol! Moved it back and started thriving again! my puple velvet plant is dying =( its vines are drying up and the leaves are limp . what can i do to revive what once was beautiful. I have bought them at Lowe’s and WalMart. But you can find them online at Amazon or Ebay lot’s of the time. I have had some luck finding these plants at Lowe’s and WalMart on occasion. And, there is a nursery not far from here that has them almost all the time, of course they’re a lot higher there. I have have always just had the purple ones, but there is a variegated variety that has creamy white throughout the purple and green. These are more rare and from what I’ve heard a little harder to grow. But, like I said I don’t have any experience with the variegated variety. These are super easy to root in water and can be indefinitely grown in nothing but water. But, they won’t sprout from leaves, you have to have a piece of the stem. I try to cut sections that have at least two sets of leaves. The roots form at the leaf nodes where the leaves grow on the vines. Cut the bottom leaves off before putting them in water and make sure that the water covers the leaf node. my plant has grown very tall. can I clip it, it has leaves at the top? I love this plant and do want to ruin it but I want to grow another and add to it. cut just above a branch. peel off branch and put in water. When you feel there are enough roots, plant in new pot and enjoy! To those who say that the Purple Velvet is hard to find I agree. It took me close to 8 years to find one. i am also glad to know that I can do cuttings. The only plant I could find was a HUGE hanging basket. Just waiting for it to fall on someones head. (cross fingers) Good luck in finding one. I got mine from Shaws. I had one of these passed from my late mother. Sadly it was in an unheated summer home one night too long and it died. I raised my plant under lights to keep the beautiful color and fertilized with half strength Miracle gro. It did beautifully and was a delight. Depending on where you live, Shoprite, HomeDepo, and Lowe’s are a few stores that carry the Purple Passion plant. I bought one of these on ebay last year. I was getting ready to buy another one because mine is just one stem/vine. I did not know that I could pinch them off and let them root. Should I pinch a leaf off…or does it have to be the main stem? To Diane…I’m sorry for the loss of your mother. I bought mine at Home Depot in Texas. I didn’t know I could pinch it off & root like that. Mine is growing into one long vine. Thanks for the help! I purchased mine at Home Depot as well, in Virginia. It is very important to follow the watering instructions. I lost my first one, which was a gift, to root rot. I’m hoping to have better luck this time. I just bought two of these at Lowe’s, they’re almost impossible to find here in Ky to. I do know that some of the nursery’s have them, but they’re really high there. These are one of my all time favorite plants. I’ve never had a problem with aphids or spider mites, but I’ve read that you can mix a little bit of insecticidal soap in some water and spray it on them. As far as having one shipped, I would think that if it’s a reputable seller and they package it right it should be fine. All the places I’ve looked at online ship plants priority, so it wouldn’t be boxed up long. This plant is lovely and very low maintance 🙂 The color is a nice pop to a container garden. Tari: I purchase one at Home Depot, but there is here in Florida. Talk to a nursary, they might be able to special order a plant or help you to find one! i took a slip from my purple passion it had roots put in soil now the bottom leaves our dropping is this normal or am i going to lose the plant. I found a beautiful Purple Passion Plant, but it is covered with aphids. What is the best way to get rid of them? I don’t know if you are still having a problem with the aphids but I have found the best way to get rid of them especially on delicate plants is just a mixture of soap and water in a spray bottle and remember to spray the underside of leaves also! I live in Michigan and have tried to get this plant. I know that this plant is very delicate and tempermental. If I have it shipped will it be okay and who is reputable to buy from in my area so that I can get it in one peice? Thank you for the information I Love the looks of this plant and I have really been having a problem trying to find these plant. When I do find them on the internet the shipping cost is more than the plant. Can you help??? That’s a gorgeous pic of Purple Passion. Thanks so much for such relevent info on care and propagation. Will come in very handy when the plant I’ve ordered arrives. I’m so looking forward to rooting cuttings and having lots of plants. Have also ordered two hindu rope plants (one variegated), which also root well from cuttings. What fun it’s going to be !